Lock in a great price for Barcelona 226 Exclusive Rooms – rated 8.4 by recent guests! The staff were excellent in every way and all very friendly and efficient. The only good thing was the relatively friendly staff. The room was beautiful, very clean, modern decoration and the bathroom very big and confortable. The location is just amazing. The bed is comfortable, clean. The staff is very friendly, gave us a good advise about the restaurent, landmark around here. The hotel stated far from the touristism area so its quite quiet and nice. worth with price. The breakfast was amazing and the staff was so sweet! Loved the bottle of cava and rose petals on the bed when we arrived. We stayed there for our honeymoon. The staff also left a very sweet note wishing us a lifetime of happiness! I was genuinely shocked when I saw my room and how overpriced it was for what I got. It was essentially in a cupboard. It was so basic and uncomfortable and for so much money. When I got back to my room one night the cleaners had left the door wide open with my possessions everywhere. I would not recommend this hotel to anyone. Everything. The best part was the Room, it was huge as well as the bathroom. Chic and cheap. I’ll recommend it to young responsible people. The hotel street vibrant with more than 5 night clubs.It was a completely different experience from other hotels I’ve been. Young staff and very cooperative. They held our luggage for more than 6 hours with no additional cost. I will def. repeat. Barcelona 226 is a very clean, convenient place to stay. The check-in staff were friendly and helpful and ordered a taxi for us on the morning of our departure. After noticing that they had kept our passport on check-in, they immediately sent staff to return them. Employees made a earlier breakfast to us because we had To go To work. Very helpfull. Featuring free WiFi, Barcelona 226 Exclusive Rooms is located in Barcelona. 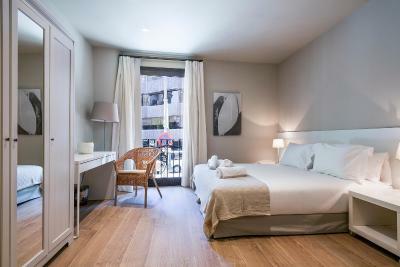 Set 2,650 feet from Passeig de Gracia, famous for its luxury shops, this hotel offers modern rooms with air conditioning. 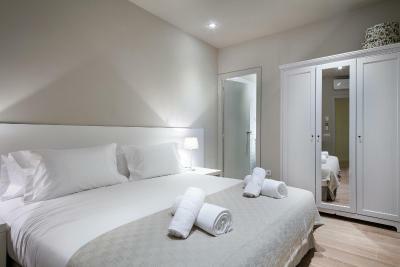 You can find several restaurants, bars, and grocery shops within a 5-minute walk of Barcelona 226 Exclusive rooms. Diagonal Metro Station is 2,800 feet from the property, and Plaza Catalunya is 2 stops away. 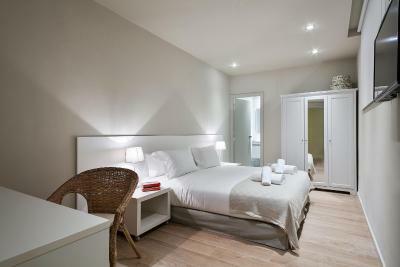 When would you like to stay at Barcelona 226 Exclusive Rooms? Featuring free WiFi, this heated room has modern décor and includes 1 single bed, a flat-screen TV and wardrobe. The private bathroom comes with a shower and hairdryer. Please note that this room is interior-facing and has no exterior view. Featuring free WiFi, this heated room has modern décor and includes 1 double or 2 single beds, a flat-screen TV and wardrobe. The private bathroom comes with a shower and hairdryer. This bright, spacious double room faces Aribau Street and has a private bathroom with a shower. This room is located behind the reception and lounge area. House Rules Barcelona 226 Exclusive Rooms takes special requests – add in the next step! Barcelona 226 Exclusive Rooms accepts these cards and reserves the right to temporarily hold an amount prior to arrival. Please note that late check-in after 21:00 is only possible if approved by the reservations department at least 24 hours before arrival. - From 00:00 to 01.00 EUR 50. The property will be going through repair works until 30 April 2019, from Monday to Friday from 10:00 to 18:00. During this period, guests may experience some noise or light disturbances. very nice people on reception, although breakfast was too late on schedule (8.30 in advance) they prepared for me and left it on the fridge. No issues regarding noises. Nice bathroom. Extraordinary, everything was just perfect. Friendly and helpful staff, delicious breakfast, nice rooms. Public parking close by. All rooms seems to be inside the building so they don’t have windows at all. It’s pretty depressing but kinda manageable. Location is very good. Near to downtown. 10mins walk from La Rambla. Breakfast could be improved, although it's not bad! Extremely nice employees, veey friendly and helpful. Very clean, modern style decoration, perfect location and great price/quality ratio. Would definetely recomend. Best staff ever. They are helpful, kind and cheerful. Very comfortable hotel where work always smiling, really friendly and helpful prople :) Room: really clean, warm, comfortable. Breakfasts tasty and fresh. Localization: close to bus station, metro stations, many restaurants and beautiful places/ buildings around. The rooms are not isolated enough. You can hear everything from the corridors. I didn’t mind much because I sleep easily with noise. Couple of small issues that I feel could have been easily fixed would have made the experience that much better, such as; a full working wet shower and frankly the breakfast can be so much better without significantly increasing your costs.